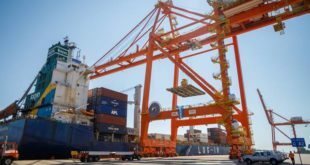 The Major ports in India have recorded a growth of 5.13% and together handled 288.38 Million Tonnes of cargo during the period April to August, 2018 as against 274.32 Million Tonnes handled during the corresponding period of previous year. 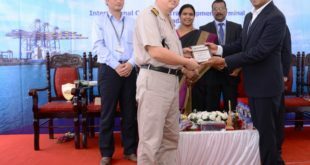 For the period from April-August 2018, nine Ports Kolkata (incl. Haldia), Paradip, Visakhapatnam, Kamarajar, Chennai, Cochin, New Mangalore, JNPT and Deendayal have registered positive growth in traffic. 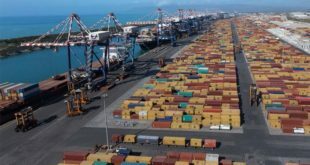 Cargo traffic handled at Major Ports: The highest growth was registered by Kamarajar Port (17.24%), followed by Deendayal Port (11.16%), Paradip (10.93%), Cochin (10.13%) and Kolkata (9.01%). 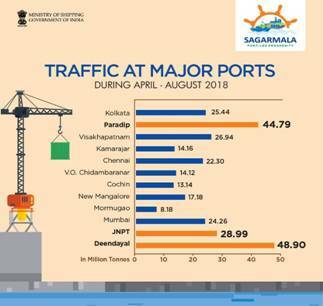 During the period April to August 2018, Deendayal (Kandla) Port handled the highest volume of traffic i.e. 48.9 Million tonnes (16.95% share), followed by Paradip with 44.79 Million tonnes (15.53% share), followed by JNPT with 28.99 Million Tonnes (10.05 % share), Visakhapatnam with 26.94 Million Tonnes (9.34% share), Kolkata (Incl. Haldia) with 25.44 Million Tonnes (8.82% share). Together, these ports handled around 61% of Major Port Traffic. Commodity-wise percentage share of POL was maximum i.e. 33.09%, followed by Container (20.83%), Thermal & Steam Coal (15.36%), Other Misc. 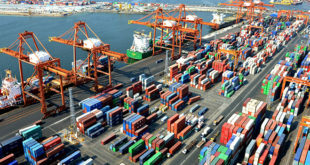 Cargo (10.63%), Coking & Other Coal (7.74%), Iron Ore & Pellets (5.77%), Other Liquid (4.41%), Finished Fertilizer (1.27%) and FRM (0.9%).